« Mount Slushmore Wins the Kelvin Slush Photo Contest! We may have mentioned that this is Pizza Month. This is very exciting for us, and hopefully for you too. We love pizza. In fact, I could probably eat it every day. So, for this month, John and I will be reviewing a different pizza spot. We’ve had some suggestions from readers about places to feature, and we’d be happy to hear more. The plan is (loosely, cuz we really don’t adhere to hard-and-fast rules around here) that on Mondays we will give you something simple. On Fridays, we will tell you how to make this into an awesome pizza topping. You may want to use this time to hone your skills as an expert dough maker. Or go clean out your local pizzeria of all their uncooked dough. 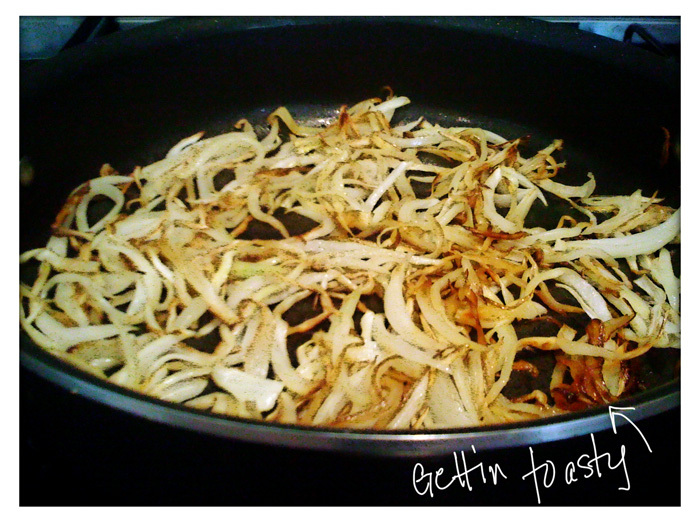 First up on our “Something Simple” for pizza is caramelized onions. I love these things. Sometimes I just make them so my apartment can smell like them. True story. OK, here we go. a LARGE (and in-charge) frying pan. Frying pans that are NOT the non-stick variety work best for caramelization purposes, but I don’t have one of those. If you do, you should use it! Slice up your onions. Heat up the oil your skillet/frying pan. Throw in onions. Wait. No, seriously, you have to wait a while. Maybe about 45 minutes depending on how many onions you crammed into that frying pan of yours. And you should only stir OCCASIONALLY. Don’t go nuts. You want them to get toasty brown and they can’t do that if you’re constantly flippin’ ’em around like a maniac. So chillax on the stirring, k? They will wilt, because they are losing water. And they will get nice and brown (like caramel, see?). This is what you want. You could watch them do this, but it’s kinda like watching the grass grow. Just check up on them every now and again to give them a gentle turn and make sure everything is on the up-and-up. The best part is: you can store these in your fridge in a Tupperware container for about a week, so they can be made ahead. Your apartment/house/kitchen/science lab will smell amazing. Neighbors and stray dogs will stop by. Don’t give them any onions. Save them for your pizza. That happens…sometimes I have to hide them from myself! I love onions. We eat more onions than anything else, I think. Caramelized onions make great sauces. I’ve not tried them on pizza yet. Glad you got freshly pressed. I’ll be back. YUM Caramelized onions. I put them on my pizza all the time. BUT I put them on the second layer over a tomato sauce and then smother with cheese. They do not crisp. Great post.. great blog!